Hreinn, a Nord citizen, is the son of Kleppr and Frabbi, and the brother of Hroki. He helps his parents run the Silver-Blood Inn in Markarth. Not surprisingly, Hreinn spends his entire life at the inn. The southwestern bedroom belongs to him, and he sleeps there every night between midnight and 8am. After waking up he heads down to the taproom and immediately starts doing his duties for the inn. After twelve long hours listening to the constant fights between his parents, at 8pm he retires to his room for some peace and quiet before his bedtime at midnight. He wears a set of barkeep clothes and a pair of shoes, and wields an iron dagger. He carries a selection of common loot and gold. Frabbi: "How are your chores coming, son?" 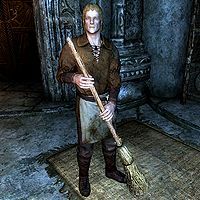 Hreinn: "I've been cleaning up spills and there is fresh linen for the rooms." Frabbi: "Aren't you wonderful! Why can't your father be more like you and your sister?" Hreinn: "Are you going to walk over to father and start hitting him again?" Frabbi: "No, not right now. Maybe later, if I'm still upset." This page was last modified on 20 March 2013, at 04:51.